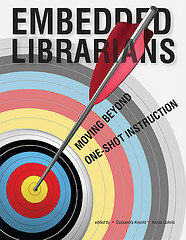 Many librarians are moving out of their libraries and actually working on-site with their users. Claire Twose and Blair Alton from the Welsh Medical Library at Johns Hopkins will discuss their experience as embedded librarians including setting up an embedded librarians program and the advantages and disadvantages of this kind of service delivery model. Renaissance Hotel Gallery Garage – Entrances are located on Calvert Street or South Street between Pratt and Lombard Streets. This entry was posted in Featured Articles, Past Events and Announcements by LLAM News. Bookmark the permalink.